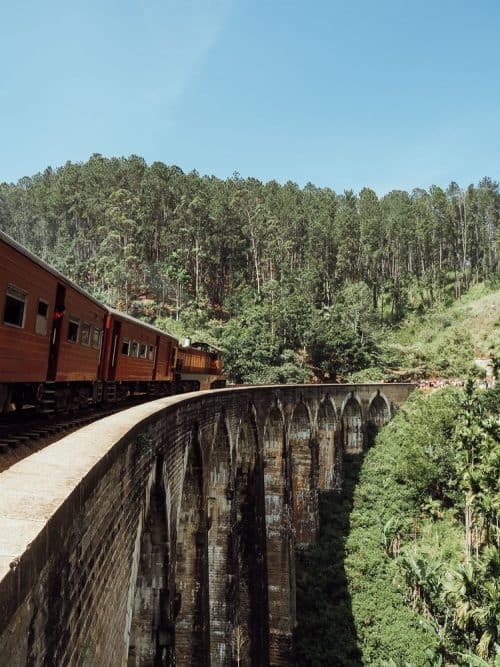 The Nine Arch Bridge, also known as The Bridge In The Sky, is a man-made masterpiece, ideally located in the ‘hill country’ of Ella, Sri Lanka. Over the past couple of years, Ella has become a tourist hotspot due to its profuse green scenery, hiking trails, epic waterfalls, historical caves and the Nine Arch Bridge! I originally intended to stay in Ella for 2 days but I ended up staying 4 days. Believe me, once you arrive you won’t want to leave. This cute hillside village has a very peaceful and welcoming vibe about it. The Nine Arch Bridge is very close to the town of Ella. To walk there from the main street it will take you about 30 minutes or you can take a tuk-tuk directly to the bridge. I recommend hiking down to theNine Arch Bridge Ella as you will pass through some tea plantations and it is more of an adventure rather than sitting in the back of a tuk-tuk. 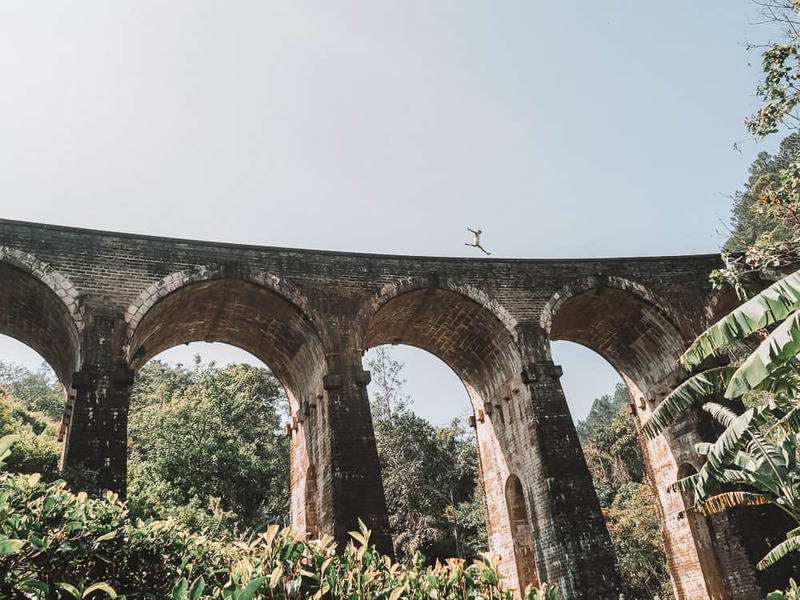 If you want to get some great shots of the Ella Nine Arch Bridge and jungle surroundings, be sure to get up nice an early for a sunrise exploration. Chances are, you will be the only person around at this time… and walking along the tracks and across the bridge is an unforgettable experience in itself. 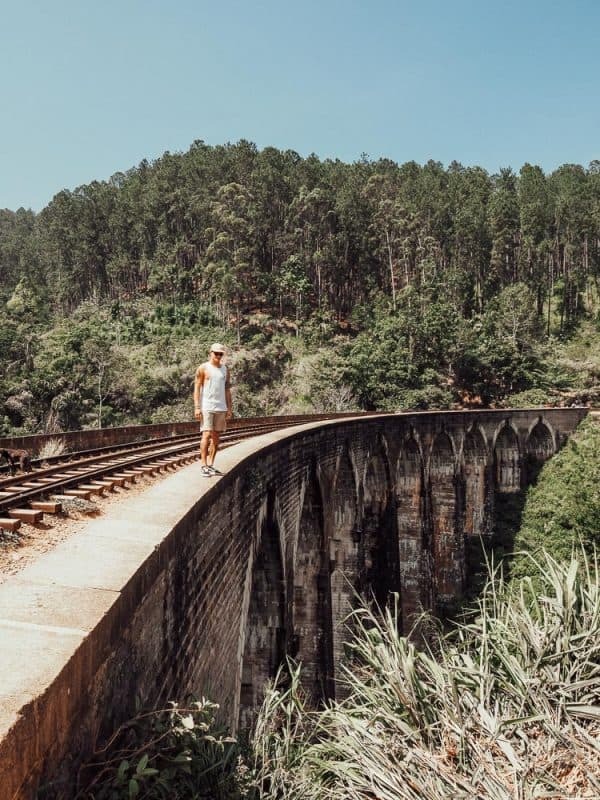 If you have the time to visit the Ella Nine Arch Bridge more than once, definitely get back down there for when a train is scheduled to pass over the bridge. I was there around 10:30am and the train came through at 11am. It is a lot busier at this time but you can still manage to get some great photos. 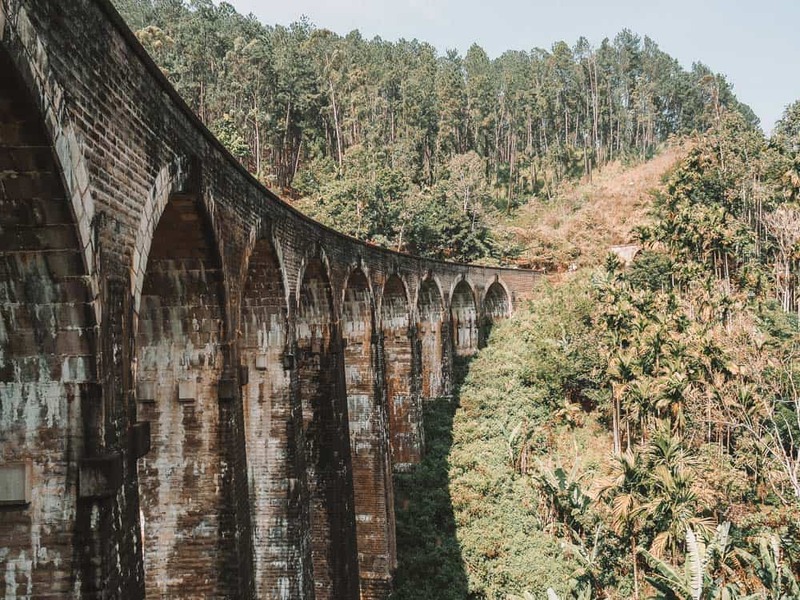 Again, if you are looking for something to do one afternoon in Ella, head down to the Nine Arch Bridge a little before sunset to experience those soothing warm colours lighting up the bridge and tea plantations in the valley below. 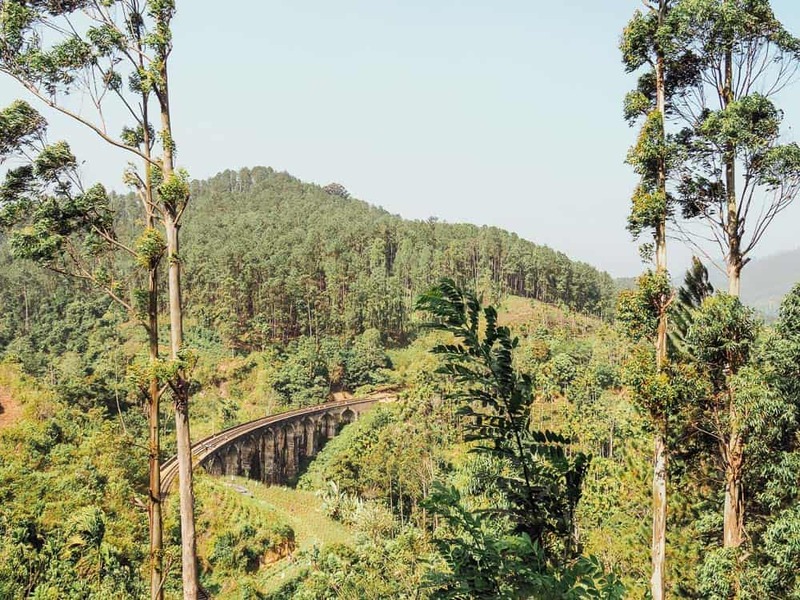 Once you have had your fun exploring on top of the Nine Arch Bridge, hike down the dirt track that leads underneath the bridge and into the tea plantation below. The dirt track is located on the side opposite to where the tunnel is. 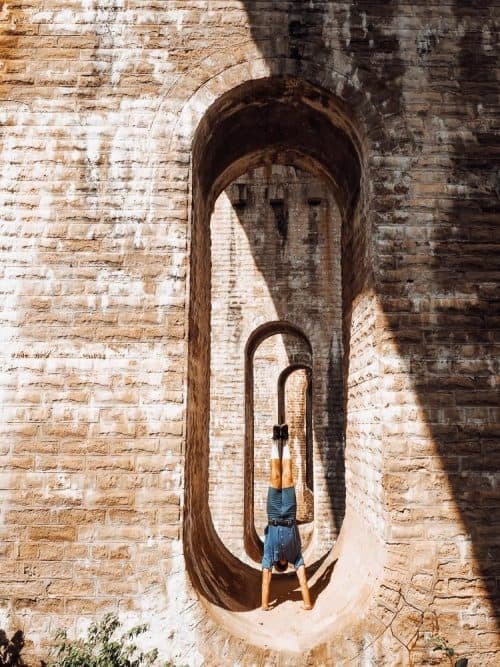 I promise that you will get an amazing perspective of how tall and magnificent the Nine Arch Bridge bridge actually is when you are standing under one of the 9 arches. If you carefully walk through the tea plantation you can also get some great angles of the bridge from here. In the history books, it is said that when construction work commenced on the Nine Arch Bridge, World War I began between the empires of Europe and the steel assigned for the bridge was reallocated to Britain’s War-related projects. As a result, the work came to a standstill, leading the locals to build the bridge with the only materials at hand being stone bricks and cement, but without steel. Human ingenuity I might add! Understanding the rich history behind this monument definitely made me appreciate the experience more… this is always something to keep in mind while travelling! I hope you enjoyed reading this article and if you have any questions about Nine Arch Bridge Ella please leave me a comment below!